Food Costs > How Much Does a Pizza Box Cost? How Much Does a Pizza Box Cost? If you own a pizza place or any restaurant that sells pizza, the pizza box is something that you cannot avoid purchasing. The cost of a pizza box will depend on the size, the quantity, if any customizations are needed and the company creating the boxes. A plain medium pizza box with no customization can cost around $0.10 to $0.30 per box, but if you need to add your logo or make some sort of customization, the costs can be about $0.30 to $0.60 per box. For example, WebstaurantStore.com sells a bundle of 100 clay 10″ x 10″ x 1 1/2″ coated boxes for $11. On the other hand, a pizza by the slice box retails for $61 for 400 boxes. On Alibaba.com, there are close to 1,000 merchants selling pizza boxes in bulk. Most of the highest rated sellers, from what we noticed, were in the $0.10 to $0.40 per box range. The best selling pizza box on Amazon.com, for instance, sells for $0.35 per box. Pizza boxes can come in a variety of forms, including clay coated, chipboard, plain corrugated material, printed corrugated material, or by the slice box. A corrugated box tends to be more rigid and sturdy, while a chipboard will be cheaper and tends to resist grease. Average sizes, commonly sold by restaurant supply retailers, will include the following sizes: 10″ x 10″ x 1 1/2″; 14″ x 14″ x 2″; 12″ x 12″ x 2″; 16″ x 16″ x 2″. Standard boxes will have checklists and areas on the side for you to write on. While most standard boxes will be white, some will have generic pictures or words on it. Typical pizza boxes that need custom logos can take upwards of four to six weeks to create. 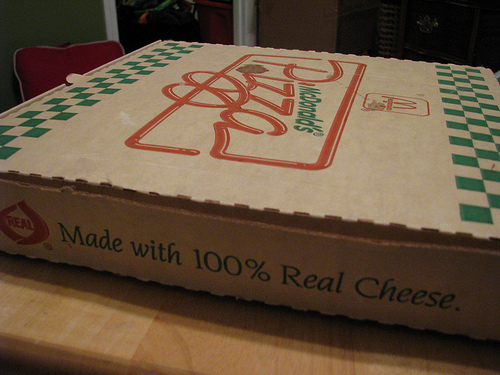 Although most pizza boxes are square, there are also some that are rectangular in shape. Square boxes are most often used for round pizzas while rectangular boxes are for square pizzas. There are also one-slice boxes, which come in the shape of a slice of pizza. Liners can be purchased for the inside of a pizza box. This is a piece of cardboard or other absorbent material that can help absorb the grease from the pizza so that it does not get all over the box or soak through. There are also liners you can put on top of the box to prevent the top of the pizza from getting stuck on the top of the box. Finally, there are liners you can put on top of the pizza that is made specifically to keep the pizza warm while it is in transit from the store to your home. These liners often cost as little as $50 per 1,000 sheets. For custom logos, some companies may require a minimum purchase requirement, which can often be more than $1,000. Remember when ordering a custom pizza box, you may have to wait a few weeks before receiving your box. The more boxes you purchase up front, the more you are going to save. Some companies may be able to cut you a deal if you sign up for a certain subscription plan. If purchasing online, many restaurant suppliers will have promotions or coupon codes. Plain boxes are going to cost a lot less than a box with a printed logo. If you are on a tight budget, it may be best to stick to a plain box instead of a customized version.